Interleukin 12 (IL-12), also known as natural killer cell stimulatory factor (NKSF) or cytotoxic lymphocyte maturation factor (CLMF), is a pleiotropic cytokine originally identified in the medium of a human B-lymphoblastoid cell line . Biologically active mouse IL-12 is a disulfide-linked, 70 kDa (p70) heterodimeric glycoprotein composed of a 40 kDa (p40) subunit and a 35 kDa (p35) subunit. While the p40 and p35 subunits by themselves do not have IL-12 activity, the p40 homodimer has been shown to bind the IL-12 receptor and is an IL-12 antagonist . Mature mouse p35 subunit is composed of 193 amino acid (aa) residues and contains seven cysteines plus one potential N-linked glycosylation site . Mature mouse p40 subunit has 313 aa, with 13 cysteines and five potential N-linked glycosylation sites . Mouse p35 and p40 subunits show 63% and 72% aa identity, respectively, to the human p35 and p40 subunits . 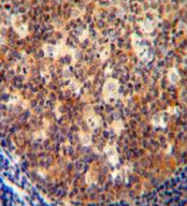 Although mouse IL-12 is active on both human and mouse cells, human IL-12 is only active on human cells. IL-12 has been shown to have multiple effects on T lymphocytes and natural killer (NK) cells. Some of these effects include the induction of IFN-. and TNF production by T and NK cells, the enhancement of cytotoxic activity of T and NK cells and the stimulation of T and NK cell proliferation. IL-12 has also been shown to be a central mediator of the cell-mediated immune response by promoting Th1 development . Cell surface staining for IL-12 on a human monocytic and a mouse macrophage cell line has been reported, suggesting that membrane-associated IL-12 may exist . Cells known to produce IL-12 include macrophages, dendritic cells, monocytes, Langerhans cells, neutrophils, and keratinocytes. 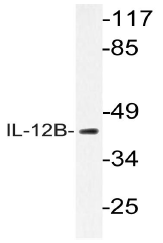 Although a human B cell line has been shown to produce IL-12, fresh B cells are apparently not producers of IL-12. Kobayashi, M. et al. (1989) J. Exp. Med. 170:827. Stern, A.S. et al. (1990) Proc. Natl. Acad. Sci. USA 87:6808. Gubler, U. et al. (1991) Proc. Natl. Acad. Sci. USA 88:4143. Gillessen, S. et al. (1995) Eur. J. Immunol. 25:200. Schoenhaut, D.S. et al. (1992) J. Immunol. 148:3433. Trinchieri, G. (1995) Annu. Rev. Immunol. 13:251. Pudda, P. et al. (1997) J. Immunol. 159:3490. Windhagen, A. et al. (1996) J. Immunol. 157:1127. Mehrotra, P.T. et al. (1998) J. Immunol. 160:2637. Wolf, S. F. et al. (1994) Stem Cells 12:154. Fan, X. et al. (1996) Biochem. Biophys. Res. Commun. 225:1063. 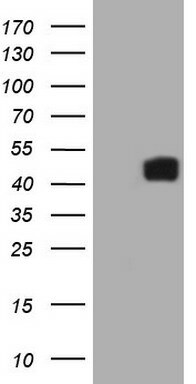 Western blot (WB) analysis of IL-12B antibody (Cat.-No. : AP20604PU-N) in extracts from K562 cells. Immunohistochemistry analysis in human tonsil tissue (formalin-fixed, paraffin-embedded) using Interleukin-12 beta/IL12Bantibody Cat.-No. AP52183PU-N (C-term), followed by peroxidase conjugation of the secondary antibody and DAB staining. 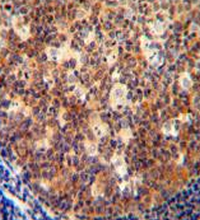 This data demonstrates the use of the IL12B antibody (C-term) for IHC. Clinical relevance has not been evaluated. 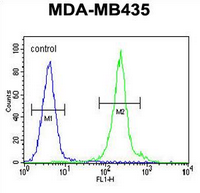 Western blot analysis in CEM,MDA-MB453 cell line lysates (35ug/lane) using Interleukin-12 beta/IL12B antibody Cat.-No. AP52183PU-N (C-term). 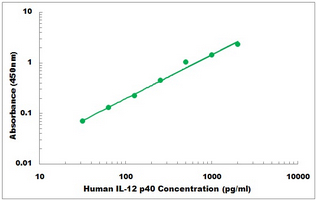 This demonstrates the IL12B antibody detected the IL12B protein (arrow). Flow cytometric analysis of MDA-MB435 cells (right histogram) compared to a negative control cell (left histogram) using Interleukin-12 beta/IL12B antibody Cat.-No. 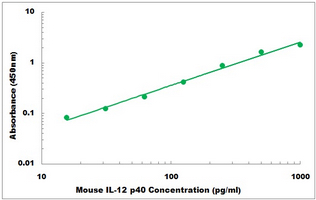 AP52183PU-N (C-term), followed by FITC-conjugated goat-anti-rabbit secondary antibodies. IL12B polyclonal antibody (A01), Lot # 050912JC01. 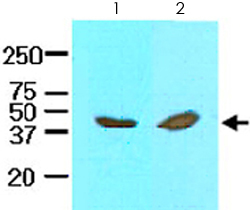 Western Blot analysis of IL12B expression in human ovary cancer. The lysates of Jurkat ( lane 1 ) and rat serum ( lane 2 ) ( 40 µg ) were resolved by SDS-PAGE and probed with IL12B monoclonal antibody, clone AT1D6 ( Cat # MAB2067 ) ( 1:1000 ). Proteins were visualized using a goat anti-mouse secondary antibody conjugated to HRP and an ECL detection system. 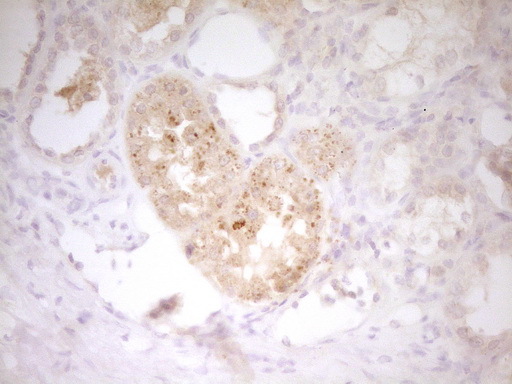 IL12B polyclonal antibody ( Cat # PAB7305 ) ( 0.1 µg/ml ) staining of human liver lysate ( 35 µg protein in RIPA buffer ) . Primary incubation was 1 hour. Detected by chemiluminescence. The Il12b polyclonal antibody ( Cat # PAB7306 ) ( 1 µg/ml ) staining of rat liver lysate ( 35 µg protein in RIPA buffer ) . Primary incubation was 1 hour. Detected by chemiluminescence. 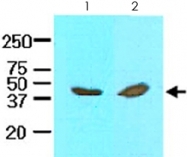 Western blot analysis of IL-12B expression in human brain (A) whole cell lysates. TA302515 (0.1µg/ml) staining of Human Liver lysate (35µg protein in RIPA buffer). Primary incubation was 1 hour. Detected by chemiluminescence. (1ug/ml) staining of Rat Liver lysate (35ug protein in RIPA buffer). Primary incubation was 1 hour. Detected by chemiluminescence.